7:00 p.m - 8:30 p.m.
exploring the notation, then this is the drumming experience for you. We also have tips to help you remember each rhythm with song. Even the warm up will excite and shift you! By the way I am not a Djembe Master! 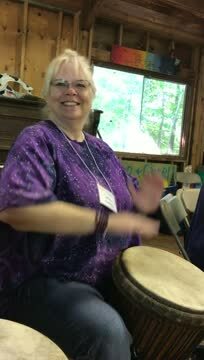 I take lessons from Djembe Master Catherine Veilleux and I go to Womyn's Drum Camp and many many drum circles, retreats and events since 2013. I want to share what I am learning. It's so much fun. Join me.